and only 3---but if you're too sick of politics to read them this eve of Election Eve, consider that power often is gained or lost in the final days with a mood of such exhaustion. The revealing photographs of our nation's leaders are by none other than Annie Leibovitz. Ask yourself who the most powerful people in the White House are. They are women who are in love with the president: Laura [Bush], Condi, Harriet Miers, and Karen Hughes. The most dispiriting and awful moment of the whole administration was the day that Bush gave the Presidential Medal of Freedom to [former C.I.A. director] George Tenet, General Tommy Franks, and [Coalition Provisional Authority chief] Jerry [Paul] Bremer—three of the most incompetent people who've ever served in such key spots. And they get the highest civilian honor a president can bestow on anyone! That was the day I checked out of this administration. It was then I thought, There's no seriousness here, these are not serious people. If he had been serious, the president would have realized that those three are each directly responsible for the disaster of Iraq. We have to be careful about sour grapes. The current result of American democracy (though this may change on Tuesday) is Republican control of the presidency, both houses of Congress and (undeniably by now) the federal courts. And that, in turn, has produced policies that, unless I badly misjudge the demographics, most readers of The New York Times Book Review don’t care for: unjustified tax breaks for the rich, a miserable war in Iraq, unbelievable indifference to civil liberties (Secret prison camps? Torture?? America??? ), among other treats. But this doesn’t prove any flaws in democracy itself. Maybe it’s what people want. The argument starts to go around in circles: How can people want what is so obviously wrong? Democracy must be flawed to produce an electorate so badly mistaken. No one forces me to believe what I believe. I believe it because reason has told me that it is right. Reason is equally available to every citizen. If self-interest cut the other way, that would be one thing. But the self-interest of most citizens coincides with what I believe, or so it seems to me. So in a fair fight, my side should win. If my side doesn’t win, that proves the fight is not fair. The other side is cheating. Thoughts like this must have gone through the minds of most liberals over the past four decades. After all, apart from cheating, there are only two possibilities: either you are wrong (and need to undergo intensive self-flagellation followed by extensive reinvention), or the voters are wrong (and even to think this is a severe violation of democratic etiquette). It is unattractive to say or think the voters are wrong. But if reason has led you to a certain set of political beliefs, the fact that others disagree perhaps should give you pause, but it should not automatically change your mind, no matter how many others there are. The notion of cheating by the other side is a way out of this dilemma. The voters are not at fault and neither are you. But what is cheating? In my view, the worst form of cheating in American democracy today is intellectual dishonesty. The conversation in our democracy is dominated by disingenuousness. Candidates and partisan commentators strike poses of outrage that they don’t really feel, take positions that they would not take if the shoe was on the other foot (e.g., criticizing Bush when you gave Clinton a pass, or vice versa), feel no obligation toward logical consistency. Our democracy occasionally punishes outright lies but not brazen insincerity. When we vote after a modern political campaign run by expensive professionals, we have almost no idea what the victor really believes or what he or she might do in office. It seems to me there is more than enough of this to explain all distressing election results without condemning either yourself or democracy. But it is a complicated case to make. And there is a simpler case available: Not content to steal elections with dishonest arguments, the other side is literally tampering with the democratic machinery to steal votes. Democracy is about counting votes after all. We used to give little thought to the mechanics of voting, confident in even our lowest moments that we at least had that bit right. Stolen elections were the stuff of ancient lore about Chicago (“vote early and often”). Then came Florida 2000. It is considered tiresome to complain that the White House was stolen in 2000. 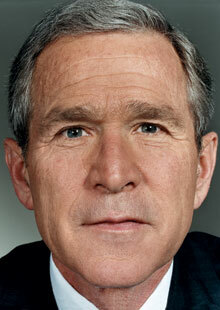 In fact, the ultimate triumph of the George W. Bush forces in the 2000 dispute has been to stamp any discussion of that episode as bad sportsmanship and therefore, in a way, undemocratic itself. You lost fair and square: “Get over it,” as Justice Scalia advised. Call me bitter: I am not over it and don’t want to be over it. I still find it shocking that democracy was so openly subverted, and even more shocking that so few others seem to share my shock. “Stolen”? That depends, as the man said, on what you mean by that word. Here is what I mean. First, a clear majority of those who voted in Florida intended to vote for Gore and walked out of the voting booth (or away from the mailbox) sincerely believing that they had done so. Vindicating the assumptions of those who did vote about whom they voted for (a standard first suggested, as far as I know, by Jacob Weisberg of Slate) seems about the least you can demand of a voting system, and Florida failed this test. Second, at every stage, Republican government officials thwarted all attempts to let democracy work in the minimal sense of the previous paragraph. Repeatedly, they interpreted the “discretion” that any public official must have as a license to produce the result they wanted, rather than as creating any obligation to do what is right. The Florida recount debate was a festival of intellectual dishonesty. On a whole series of technical issues (those butterfly ballots mispunched by the confused old ladies of Palm Beach, or military absentee ballots mailed after the deadline) there were plausible arguments on both sides. And these arguments had no obvious ideological cast. There is no natural conservative or liberal position on the dilemma of the dangling chad. So it is remarkable — amusing, depressing, not surprising I guess — how quickly and passionately Democrats and Republicans staked out their respective cui bono positions. But Republicans controlled the state and federal governments, so they got their way. The Supreme Court’s ruling in Bush v. Gore was surprising. Shocking, in fact. Probably the most fatuous — i.e., knowingly stupid — Supreme Court decision in history. The justices of Plessy v. Ferguson (1896), who upheld racial segregation, could at least plead historical blinders. The majority justices of Bush v. Gore have no such excuse. Both as a raw assertion of judicial power and as a more specific interpretation of the 14th Amendment, it was not merely wrong, but spectacularly wrong in precisely the ways that conservative justices like Scalia, Rehnquist and Thomas had been objecting to for years. The justices invented a nonsensical equal-protection “right” — essentially, the right to an equal risk of having your vote miscounted — and held that any attempt to correct mistakes through a recount was unfair to those who didn’t get recounted. And then they declared this alleged right to be a one-time-only offer, like a grocery-store coupon. As Adam Cohen pointed out recently on the New York Times editorial page, the coupon has indeed expired. Bush v. Gore is rarely cited or applied in other situations. Like generals, reformers and conspiratorialists are always fighting the last war. The idea that a presidential election can be stolen was the stuff of airport fiction until someone did it. Now and here on out, every election will come with a theory of how the winner stole it (just as, since Vietnam, every war now comes with a medical “syndrome” for soldiers to sue over). Although resentment over the actually stolen election of 2000 is remarkably muted, there is a noisy contingent of citizens, led by Robert F. Kennedy Jr., who are convinced that the Republicans stole the election of 2004. “Was the 2004 Presidential Election Stolen?” by Steven F. Freeman and Joel Bleifuss, answers its own question with a resounding “yes.” The evidence concerns the state of Ohio, which would have changed the result if it had gone for John Kerry instead of Bush. The argument is that Ohio did go for Kerry, based on exit polls, then mysteriously went for Bush in the final result. “Exit polls are a vital tool to ensure election integrity,” the authors say. But that has never been their purpose, and the authors offer no particular reason to believe the random exit polls and disbelieve the actual vote. The great flaw in American democracy is not electoral irregularities, purposeful or accidental. It’s not money (which, even under current law, cannot in the end actually buy votes). It’s not even the inexplicable failure of all other Americans to vote my way or of politicians to enact my own agenda. It’s not the broken promises and the outright lying, although we’re getting close. The biggest flaw in our democracy is, as I say, the enormous tolerance for intellectual dishonesty. Politicians are held to account for outright lies, but there seems to be no sanction against saying things you obviously don’t believe. There is no reward for logical consistency, and no punishment for changing your story depending on the circumstances. Yet one minor exercise in disingenuousness can easily have a greater impact on an election than any number of crooked voting machines. And it seems to me, though I can’t prove it, that this problem is getting worse and worse. A few days before the 2000 election, the Bush team started assembling people to deal with a possible problem: what if Bush won the popular vote but Gore carried the Electoral College. They decided on, and were prepared to begin, a big campaign to convince the citizenry that it would be wrong for Gore to take office under those circumstances. And they intended to create a tidal wave of pressure on Gore’s electors to vote for Bush, which arguably the electors as free agents have the authority to do. In the event, of course, the result was precisely the opposite, and immediately the Bushies launched into precisely the opposite argument: the Electoral College is a vital part of our Constitution, electors are not free agents, threatening the Electoral College result would be thumbing your nose at the founding fathers, and so on. Gore, by the way, never did challenge the Electoral College, although some advisers urged him to do so. currently hold and will end up taking control of the House, 237 to 198.
the Midwest is for the Democrats. Governorships and end up with a total of 29 of the 50 Governorships. past. I believe the total abortion ban in South Dakota will be repealed. Senate (plus/minus 2), and 7 Governorships (plus/minus about 2). There are still some people urging Mr. Bush to change course. For example, a scathing editorial published today by The Military Times, which calls on Mr. Bush to fire Donald Rumsfeld, declares that “this is not about the midterm elections.” But the editorial’s authors surely know better than that. Mr. Bush won’t fire Mr. Rumsfeld; he won’t change strategy in Iraq; he won’t change course at all, unless Congress forces him to. At this point, nobody should have any illusions about Mr. Bush’s character. To put it bluntly, he’s an insecure bully who believes that owning up to a mistake, any mistake, would undermine his manhood — and who therefore lives in a dream world in which all of his policies are succeeding and all of his officials are doing a heckuva job. Just last week he declared himself “pleased with the progress we’re making” in Iraq. In other words, he’s the sort of man who should never have been put in a position of authority, let alone been given the kind of unquestioned power, free from normal checks and balances, that he was granted after 9/11. But he was, alas, given that power, as well as a prolonged free ride from much of the news media. The results have been predictably disastrous. The nightmare in Iraq is only part of the story. In time, the degradation of the federal government by rampant cronyism — almost every part of the executive branch I know anything about, from the Environmental Protection Agency to the Centers for Disease Control and Prevention, has been FEMAfied — may come to be seen as an equally serious blow to America’s future. And it should be a matter of intense national shame that Mr. Bush has quietly abandoned his fine promises to New Orleans and the rest of the Gulf Coast. The public, which rallied around Mr. Bush after 9/11 and was still prepared to give him the benefit of the doubt two years ago, seems to have figured most of this out. It’s too late to vote Mr. Bush out of office, but most Americans seem prepared to punish Mr. Bush’s party for his personal failings. This is in spite of a vicious campaign in which Mr. Bush has gone further than any previous president — even Richard Nixon — in attacking the patriotism of anyone who criticizes him or his policies. That said, it’s still possible that the Republicans will hold on to both houses of Congress. The feeding frenzy over John Kerry’s botched joke showed that many people in the news media are still willing to be played like a fiddle. And if you think the timing of the Saddam verdict was coincidental, I’ve got a terrorist plot against the Brooklyn Bridge to sell you. Moreover, the potential for vote suppression and/or outright electoral fraud remains substantial. And it will be very hard for the Democrats to take the Senate for the very simple reason that only one-third of Senate seats are on this ballot. What if the Democrats do win? That doesn’t guarantee a change in policy. And I wonder why I didn't think of the "cataclysmic" fight the Bushies will offer when the investigations begin myself. Of course they will stonewall. Perhaps I (and others?) may have ignored that aspect of Bushland since just taking back one of the two houses of Congress has appeared daunting enough. I still don't know what to expect tomorrow. The lawyers, I've heard, are sharpening their knives. They may need to if the dead rise in Poughkeepsie or voters are turned away in droves in Florida or Ohio. I understand that there have already been some irregularities. Krugman nicely describes Bush, in a succinct manner. A recent book came out claiming the Bushies snicker at the evangelicals. Some undoubtedly do, since power, after all, attracts ambitious secular temperaments too, even in Bush's White House. But Tony Judt in the New York Review of Books wrote a lengthy description of how Bush has put key evangelicals into many key positions, such as EPA, the Justice Department, etc. President Bush has been quite kind to the rightwing fundamentalists, even if some secular Republicans think they are yokels. that RI will go for Whitehouse. It looks iffy at the moment. Our state senator came by earlier today and told Ellen that from a 14 point lead Whitehouse has fallen to 0. Chaffee has been tarring him with allegations of corruption or incompetence (carefully worded) and the tar may have stuck. I too wonder if I'll be voting for someone for the US Senate who's corrupt tomorrow. But I want to help make your friend's predictions come true. READ THE VOTERS REGISTRATION APPLICATION! YOU GIVE UP YOUR RIGHT TO ELECT FOR THE PRIVILEDGE TO VOTE AND ALSO EVERTHING YOU OWN NOW BELONGS TO THE STATE FOR THE PRIVLEDGE TO VOTE! 10 Nov 2006 @ 22:36 by jobrown : Thanks guys! Thanks Jazzo for your never-ending Fight for What's Right -however "small" your Baby steps might be. MOST of us humans don't even "crawl" yet -let alone take any s.c. "Baby-Steps"!!! Thanks, vax, for once again making "the rest of us" ( and certainly me, A-d), aware of what will make the Baby Step/s a little more "worthwhile" (read: conscious) and "how -to go about it" so to speak! Great link!! !